Kristen Doute Banned From Vanderpump Rules Trip? Photos - Katie & Tom's Honeymoon & More! Kristen Doute Banned From Vanderpump Rules Trip? Where In The World Is The Cast? “Cool. All of my friends will be in tropical locations while I hold the fort down in LA. @MusicKillsKate @stassi @BNCartwright @scheanamarie,” Kristen tweeted yesterday. Kristen later complained that Vanderpump Rules producers wouldn’t let her go? “I actually feel like I need to hate tweet so that I don’t hate text right now… #whatwouldjaxdo @mrjaxtaylor,” Kristen added. SO, where exactly is the rest of the cast? 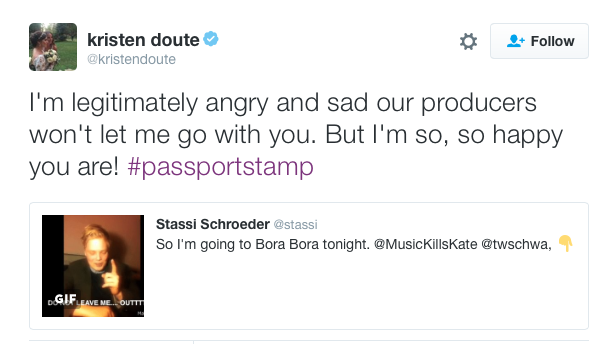 It seems Stassi Schroeder is joining Katie Maloney and Tom 2 on their honeymoon in Bora Bora?!?! related – BACHELOR/BACHELORETTE PARTIES IN NEW ORLEANS! Jax Taylor and Brittany Cartwright are in the Bahamas soaking up some sun and hopefully no illegally-obtained sunglasses. Scheana Marie and Mike are in Hawaii – AGAIN. (Just stay there already!). I dunno where Ariana Madix and Tom 1 are, since they’re bad at social media. Photos of the cast travels are below! TELL US – WDKD: WHAT DID KRISTEN DO? WHO WOULD YOU MOST LIKELY WANT TO GO ON VACATION WITH?